PCM-6892 Rev. B is the latest revision of PCM-6892 Rev. A. This model possesses all the features in Rev. A but the only difference is the Intel Ultra Low Voltage Celeron 400/650MHz processor that was introduced into Rev. B. 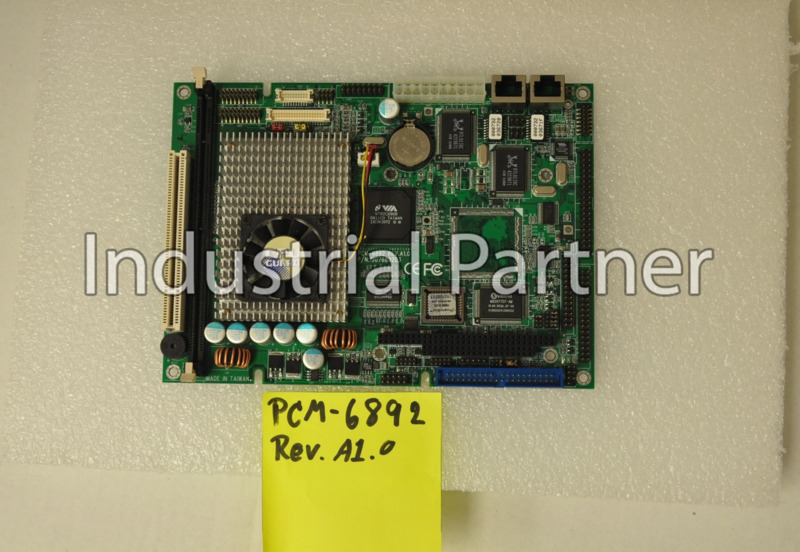 With this processor, PCM-6892 Rev. B will have better performance and lower power consumption than PCM-6892 Rev. A. More options for your expansion Compared with PCM-6892 Rev. A, the new PCM-6892 Rev. B has a Mini PCI slot. Mini PCI has the excellent ability for extension in your application. Therefore, Mini PCI can go with extension devices such as Gigabit LAN, USB 2.0 or IEEE 1394 to fulfill applications. Marvelous Graphic Accelerator The built in VIA VT8606 2D / 3D Graphic Accelerator can offer high-resolution display quality and supports 18/36 bit TTL or LVDS LCD Display, plus TV out. VIA VT8606 is a superior chipset with all kinds of integrated functions. For example this model has Dual Ethernet, Audio, USB, Serial port, and Parallel port, Such functions are bound to be sufficient for your application. With 2 slots PCMCIA and Mini PCI plug, you can make a choice depend on your application and need. High performance and Low power consumption Overall, PCM-6892 Rev. B provides an operating environment with low power consumption and multiple functions. The compact size and flexible expansion interfaces will be the best choice for any embedded application which has limited space and a rugged environment.